My full time job is to research, explore, publish, and promote our beautiful city and while I’ve honed my craft over the last 13 years, I still get stumped from time to time when it comes to planning our own local adventures. With 7 family members visiting us this month from all over the US Midwest, I knew I wanted to show off at least two things: The ocean and the mountains aka the Sea to Sky. 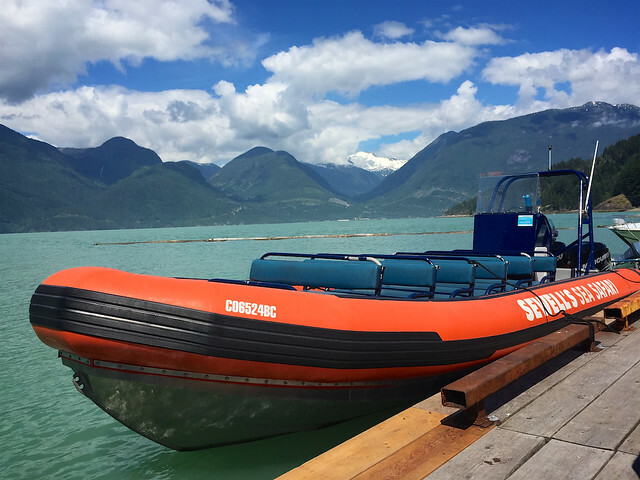 Thankfully, the folks at Landsea Tours have the perfect tour for just such a request, the Sea to Sky Tour! I booked a tour in advance and on the morning of our experience, all 9 of us Bollwitts met our guide Meghan for the day and piled into a comfy sprinter van that was parked outside our guests’ hotel. 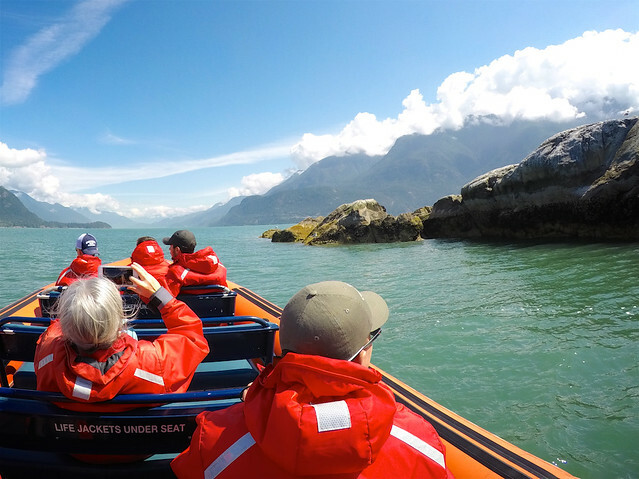 The first stop was just 20 minutes away at Sewell’s Marine at Horseshoe Bay where we got suited up for a zodiac deep fjord tour across Howe Sound. John and I have done a Sea Safari with Sewell’s before, and actually spotted a humpback whale with them last summer. It was a great way to get our family on the water, and our guide Casey provided insights on local wildlife, geography, and more. 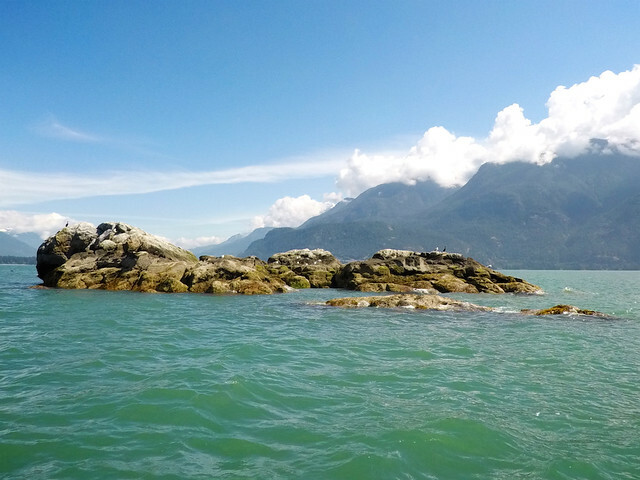 Howe Sound is the southern most fjord in North America and it hosts a variety of views — from the mansions in Lions Bay to Oystercatchers on Christie Islet. 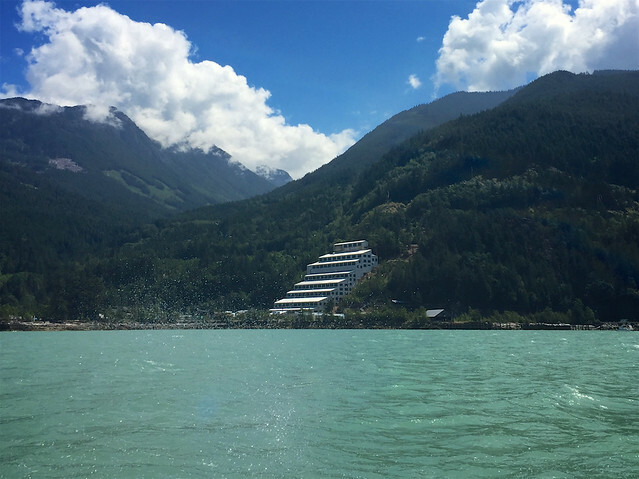 We slipped through the sound to where red arbutus tree trunks gripped granite islands with slopes that dipped right down into the turquoise waters. Seals, shore birds, eagles all spotted and eagerly photographed. Casey was not only skilled at navigating the waters but she even spent time researching marine animals, seals in particular, before coming to Sewell’s. This knowledge came in handy when stopped at Pam Rocks where dozens of seals, including some little pups, were sunning themselves. Scratching their flippers on the kelp and barnacle covered rocks, it looked as though they were waving to us, so of course we reciprocated. I love this tour so much especially because the zodiac is like a roller coaster on water, the family may have heard me let out an excited squeal or two along the way. 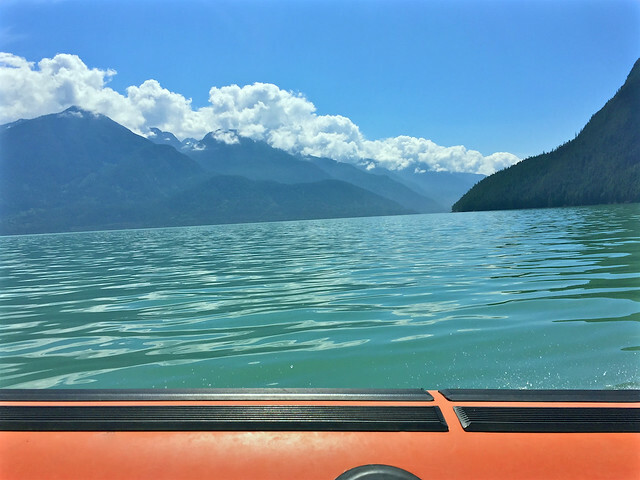 The 60 minute boat ride took us all the way up to Britannia Beach where we disembarked the zodiac, shed our red safety suits, and hopped back in the van for our next destination: Shannon Falls. 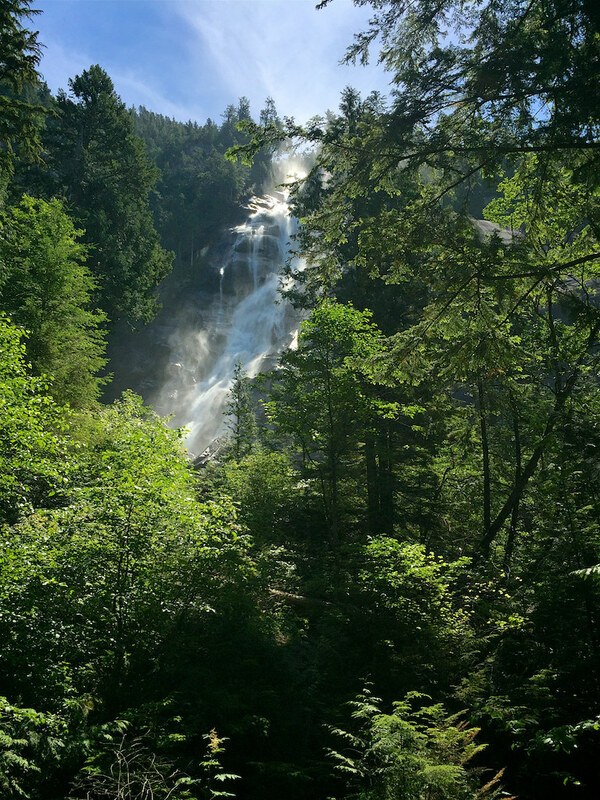 Shannon Falls is the third highest waterfall in the province, rising 335 metres above Highways 99 on your way up to Squamish. The family loved walking through the forested path, which was cooled by the rushing water above, and spending time on the falls viewing platform. All board the van again and we were heading to the Sea to Sky Gondola. 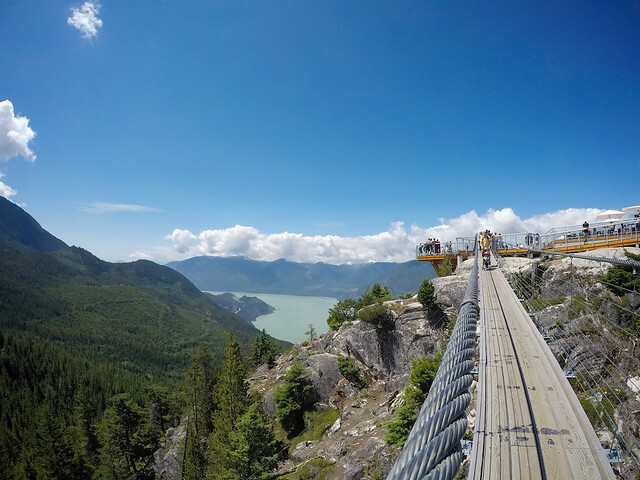 From the shores of Britannia Beach, to climbing 850 meters up Mount Habrich! 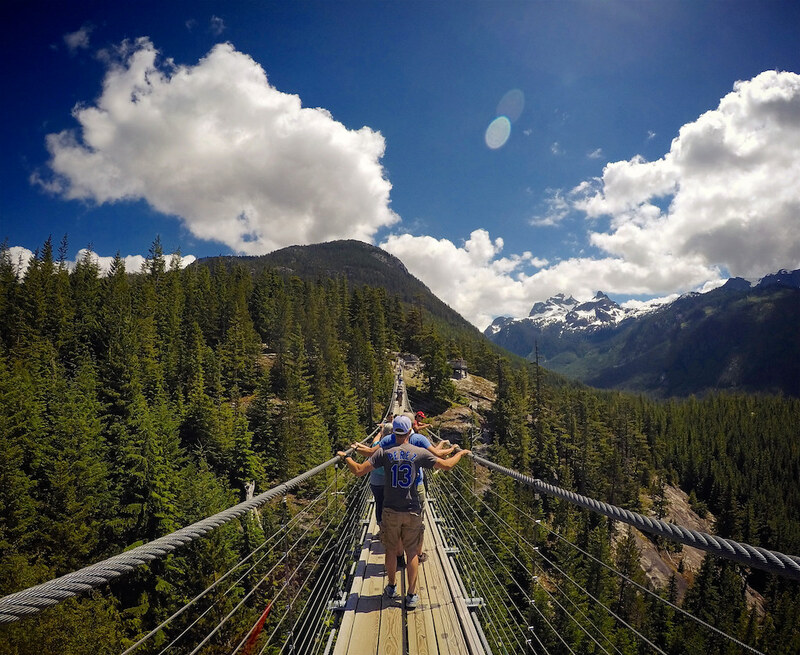 Once at the top, just past the Summit Plaza, where some axe throwing was taking place, we gathered for a group photo on the Sky Pilot Suspension Bridge before we split to tackle two different trails. We reunited at lunch on the Summit Lodge’s patio, with an amazing panoramic view of Howe Sound and Squamish. John and I ordered some bratwurst from the barbecue that came with corn on the cob, roasted veggies, and coleslaw. We complimented it with Howe Sound Brewing’s Sky Pilot Northwest Pale Ale to make a perfect Sea to Sky combo. Following a satisfying lunch and spectacular views, Meghan met us at the gondola to take us back down to Basecamp where our van was waiting. 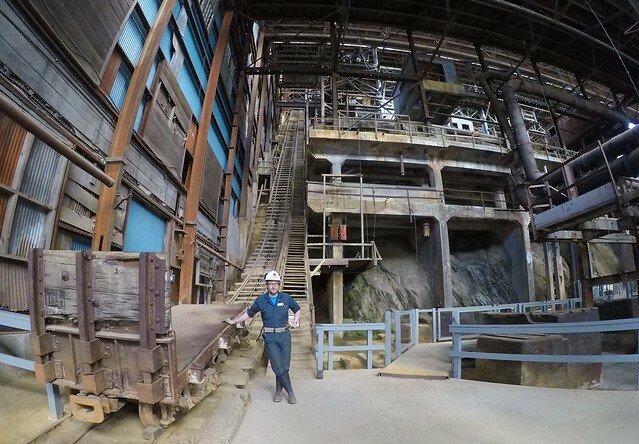 The next stop was the once-largest producer of copper in the British Empire, the award-winning Britannia Mine Museum. 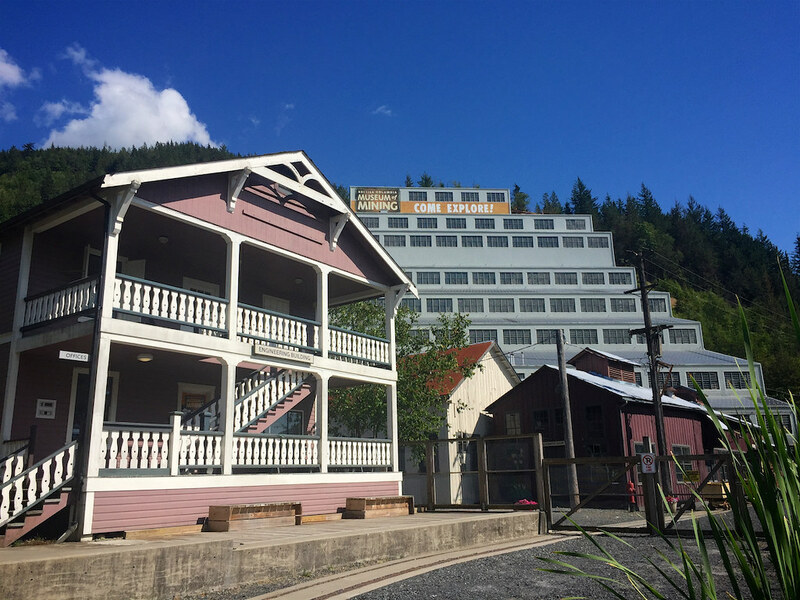 This National Historic Site has a train tour that goes into the mountainside where you can learn about the mining process, and it has several company buildings on site with videos, displays, hands-on exhibits, and even some gold panning. I can see how a family could spend an entire day on the grounds! After an afternoon sugar boost with some gift shop caramels and shortbread, it was time to get into the van one last time for our return ride to Downtown Vancouver. It was so nice to not only have someone else driving, and all admissions included in the tour package, but to have a knowledgeable guide who shared facts and tidbits about the region along the way. Meghan was so fun and entertaining, and I’m always impressed when someone can tell me something I don’t already know about the area. 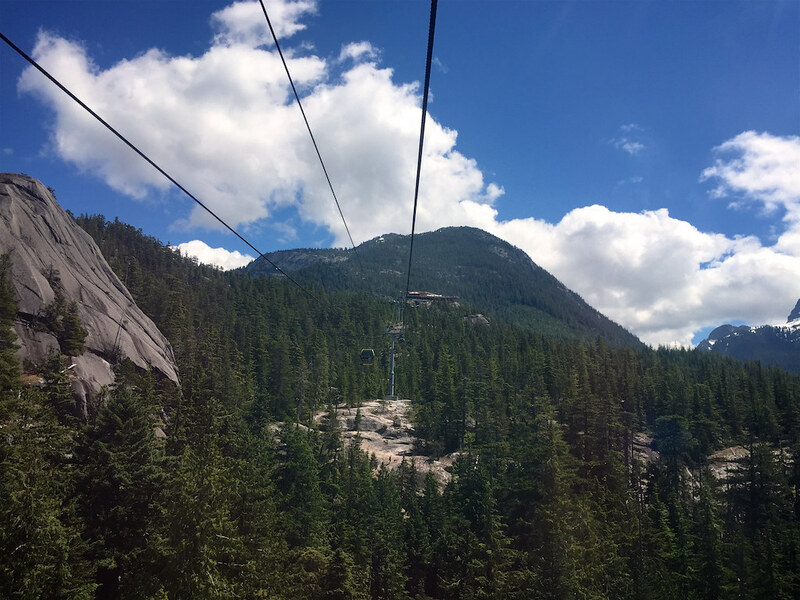 The Sea to Sky Tour was the perfect way to start off our family’s trip to Vancouver, featuring our gorgeous coastal setting, Pacific Northwest wildlife, recreation options, and diverse history. It’s exactly what I wanted to show off. If you book your tour, which I highly recommend, tell them Miss604 sent you! Who knows, you might just see me on another one later this season since they run through to the end of September. Views are my own. Our tour was compliments of Landsea Tours.